Sometime in the late summer of 1976, Sanjay Gandhi asked if I wanted to go flying with him... After first attempting to teach Karan Thapar to fly (not very successfully) Sanjay Gandhi took the controls and performed a series of aerobatics, not particularly dangerous but nonetheless thrilling. Once they were further away from Delhi, he became even more daring. Suddenly, he decided to scare the farmers working in the fields below by aiming the aircraft straight at them. As he dived down, they scattered and ran, fearing for their lives. At the last moment, Sanjay pulled up dramatically and waved at the bewildered farmers, clearly chuffed with the whole performance. The manoeuvre required nerves of steel and tremendous self-confidence, both of which Sanjay possessed in plenty. In Devil's Advocate, Karan dives deep into his life to come up with many such moments. Included here are stories of warm and lasting friendships, such as with Benazir Bhutto, whom he met while he was an undergraduate. He also talks about his long association with Aung San Suu Kyi and Rajiv Gandhi. However, not all friendships lasted-for example, with L.K. Advani, with whom he shared a close bond until an unfortunate disagreement over an interview caused a falling-out. The tension generated during an interview has spilled over off-screen multiple times, and Karan discusses these incidents in detail. For instance, when Amitabh Bachchan lost his cool during a post-interview lunch or when Kapil Dev cried like a baby. And there's the untold story of two of his most controversial interviews-with Jayalalithaa and Narendra Modi. While Jayalalithaa laughed it off later, the after-effects of Modi's infamous walkout have grown worse with time. 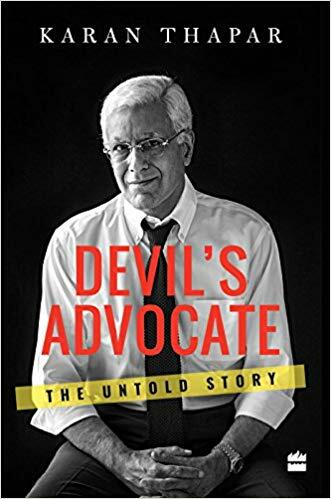 Riveting and fast-paced, Devil's Advocate is as no-holds-barred as any of Karan Thapar's interviews. Karan Thapar worked for ten years in television in the United Kingdom with London Weekend Television, on programmes like Weekend World, The World This Week, The Business Programme, The Walden Interview and Eastern Eye. Prior to that, he worked as a foreign correspondent with The Times, London. After his return to India in 1991, he presented well-known programmes such as Eyewitness (Doordarshan), HARDtalk India (BBC), Devil's Advocate (CNN-IBN) and To The Point (India Today). Presently, he is the president of Infotainment Television (ITV). He writes a weekly column, 'Sunday Sentiments', for the Hindustan Times and a fortnightly column, 'As I See It', for Business Standard. Karan Thapar has won several awards such as the Asian Television Award for Best Current Affairs Presenter (five-time winner), the Ramnath Goenka Broadcast Journalist of the Year Award (2009) and the International Press Institute - India Award for Excellence in Journalism (2013).